I also bumped this post from 1/29 for my instapundit readers. Thanks Glenn again for a very fun unexpected surprise. You MUST read this blog entry entitled “The Real Mitt Romney” by Candace Selima in California. 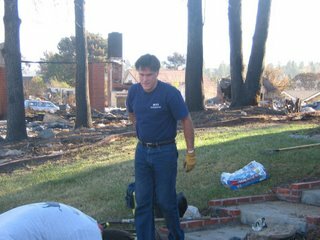 It shows Mitt Romney giving selfless service to a family that had a burned down tree from a California fire. Wow, this article completely change my way of thinking. I am convinced that Mitt makes a wonderful presidential candidate and that he will be a remarkable President. Mitt may be the only candidate who is actually capable of leaving a legacy that hasn’t been given to government since the 80’s. Mitt may be the only presidential candidate willing to give anonymous service, (by wielding a shovel of all things) just because he is a Christian. Don’t we need someone like this for president? Reading this story just gave me the last nip in the you know what to jump on Mitt’s band wagon. I think I am even going to ask to be a part of his campaign? I watched the State of the Union address last night, and really enjoyed Mitt’s comments during the aftershow. I have been getting more informed about the Presidential election lately. Every day I love Mitt more and more. I am convinced that he is the new Reagan to cure our very sick economy. I also know because of Mitt’s life accomplishments (in government and out) that he will be able to handle pretty much whatever comes his way with success. I hope I won’t offend Ann Romney or my husband , but LOOK at this man…he will be the best looking president since JFK. I mean really, he gives JFK a run for his money, and the man unlike JFK is a faithful husband, father, and grandfather. Holy cow. Do we have a winner or what? I was listening to Rush earlier today and there was a byte from a Florida poll voter. You can vote for whoever you would like, but whatever you do, go and read this story. It will inspire you, I promise. I don’t know about the rest of you, but I am going to stay up all night tonight to hear the results from the Florida. ← Does my man hate Mitt? I am sure Ann says the same thing about her husband. He is a handsome guy.He’s got my vote. My dad has been a part of his campaign team since 2006. He is a nice looking man. I voted for him today and so did Jordan. It’s close right now…hopefully he’ll take Florida! If you’re interested…my dad has spent a great deal of his retirement on politics lately. He’s one of the local delegates for Romney (vote for him!). He’s been spending a lot of hours on the phone the past couple of weeks calling people in the states about to vote. I’m pretty sure he said you can do it as long or short a time as you’d like. Let me know if you want more details, Little-Miss-Political-Enthusiast. I like those pics or Mitt. He CAN win. Agreed, he is handsome and our best hope for a better America. I researched the candidates throughly when the campaign season began. From the beginning there was no question Mitt Romney is the man to straighten out our economy, our government and still handle, without fear, the war on terror and foreign affairs. I’m stunned at how many people cannot see John McCain for the loose cannon that he is. We’ll be at war with every nation in the world if he is president. His hair trigger temper will assure that. i knew the truth about why like Mitt would come out eventually…you’re in love with him! we all have to have our celebrity crushes…just kidding. it has taken a long time to convince me to vote for the guy but i did. now i’m glad i did. his wife is what won me over. she is a good woman and it always takes a good woman to back a good man. So who was the yahoo that was taking the picture of Mitt and Ann when obviously a prayer is being offered??? ?Musta been one of those liberal godless reporters!